The Cryptectum uses blockchain technology to refine a highly proven investment strategy in Switzerland - the investment in real estate. Rental of real estate in Switzerland has been an extremely lucrative investment with up to 8% return per annum for a very long time without interruption. Unfortunately, the minimum investment amounts required to buy a property are very high, as, for example, 3-room apartments in a city already cost over one million Swiss francs. This is where the Cryptectum comes in and, with the help of blockchain technology, allows small investors to profit from the rental of real estate. 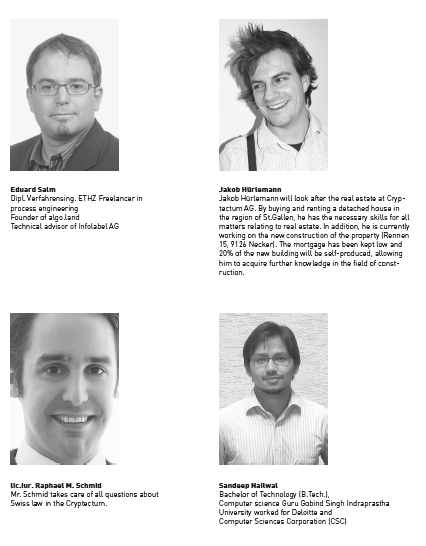 Via crowdfunding the Cryptectum collects funds, acquires a property and rents them. Blockchain technology in turn helps to distribute rental income to investors in the simplest and most cost-effective way. In addition, the Cryptectum maintains the acquired property, which is a big plus for the investor, since he does not have to worry about it. However, an investor would also like to have a say in what property the Cryptectum acquires or whether the capital of the Cryptectum should be increased. The Cryptectum has integrated so-called proposals into the Smart Contract. The investor thus has the opportunity to vote on the acquisition of real estate or increase in liquidity. With Cryptectum, investors get the opportunity to benefit from the Swiss real estate market for as little as $ 1 investment. Investing in Cryptectum is a solid investment with a relatively high return and low risk. houses have been occupied by the owners themselves. countries. This is illustrated in the graphic below. is quite easy due to the high demand. The laws for the protection of tenants are very strong. has been increased immigration of EU citizens to Switzerland. increase is always been positive exept 1976. Cryptectum collects funds via crowdfunding to buy and rent real estate in Switzerland. The revenues are distributed to the investors. Due to the low mortgage rates in Switzerland (about 1%), the real estate is 50% financed with mortgages. The special thing about Cryptectum is the collection of funds via Blockchain. The administration of the shares will also be done using blockchain technology. This means that the participants acquire tokens. The tokens can be used to distribute the profits from the rental income and to sell the shares. 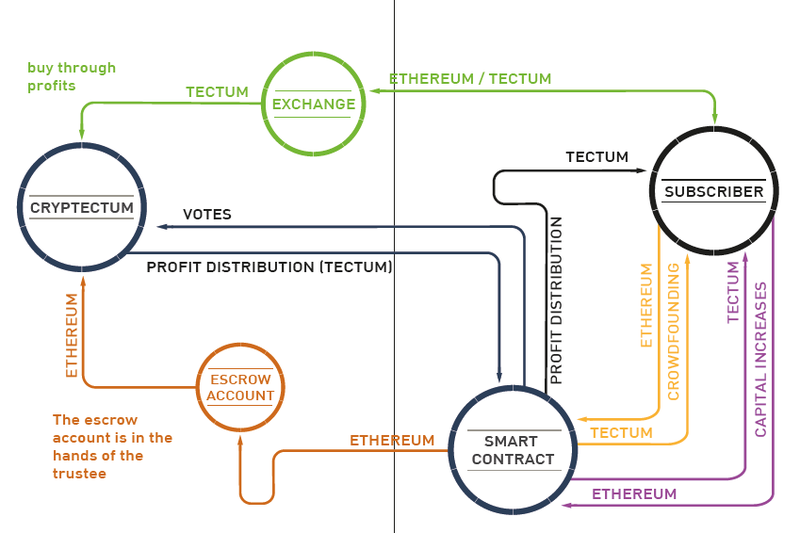 The name of the token is „Tectum“. The Ethereum Blockchain is chosen as the blockchain because it enables „Smart Contracts“. The Ethereum Blockchain is the most common blockchain with smart contracts, so there are plenty of ways to set up a wallet. Even without downloading the complete Blockchain, a wallet can be created via Metamask or MyEtherWallet, which can record any Altcoins based on Ethereum. The Smart Contract also allows shareholders to participate in Cryptectum AG. This way, counterfeit-proofing can be coordinated via proposals. Shareholders can thus decide on the purchase of real estate. The management of Cryptectum AG propose a property for sale and the tokenholders can either approve or reject the purchase. A token has a voice. Also, the tokenholders can vote on new issue of tokens for capital increase. 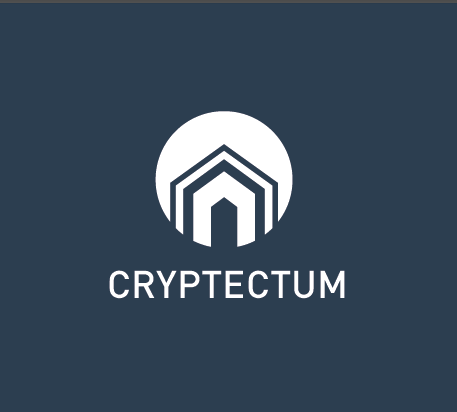 In addition to the positive influence of the „wisdom of the crowd“, it is thus ensured that the persons involved in Cryptectum AG do not sell their own real estate to Cryptectum AG. The uncomplicated crowdfunding and simple management of the shares via Blockchain makes Cryptectum AG extremely efficient and can pay more of the income to the participants. There are a total of 1.5 million tokens available. Of these, 85% can be earned via crowdfunding for $ 1 per Tectum. The small cap is defined at $150 000, hard cap at a low $1,25mln. Crowfounding is carried out through a Multisignature Wallet connected to the contract. The participants pay into the wallet and receive a corresponding number of tokens. The administrators (Cryptectum AG) can submit proposals for voting to the participants. On the one hand, real estate can be proposed for purchase, on the other hand the increase in the number of tokens can be proposed. This may be necessary to allow Cryptectum AG to grow and increase the liquidity of the tokens. The participants can vote on the proposals with yes or no. However, as long as voting is on, the tokens cannot be sold after voting. This prevents multiple matching with the same token. Cryptectum AG purchases tokens on the market, provided these are available at reasonable prices. The purchased tokens are distributed among the participants. If Cryptectum is closed and all tokens have been purchased, the SmartContract will be closed. The profit distribution will be made the following way: With the revenue, tokens are bought from the market. Hence the participants can easily sell their tokens if they wish to. Cryptectum will buy tokens to max 5% over market value. Once sufficient tokens are available, they are will be burned. If the participants agree to a capital increase, further tokens are created and offered for sale. The advantage for the token holder is increased liquidity of the token. The SmartContract also allows the token holders to participate in Crytpectum AG. In this way it is possible to vote against suggestions (so-called „proposals“). The operators of Cryptectum propose a property for purchase and the token holders can either cancel or refuse the purchase with a token having one vote. The token holders can also vote on new issuance of tokens for capital increase. In addition to the positive influence of the «Wisdom of the Crowd» it is ensured that the people involved in Cryptectum AG do not suddenly sell their own real estate to Cryptectum AG. Through the efficient structure and easy management of the assets deposited via blockchain, the costs for the token holders can be kept down without competition. Estate agent fee The search for an optimal property and its purchase is very time-intensive. The Crytectum will receive a fee of 3.5% of the total price for each purchased property. Administrative fees For the administration of the real estate, the fee is 8.7% of the real estate income. The real estate success is defined by the net rental income less than a year, net of mortgage and maintenance and operating costs.